Church members Brian Preuss and Abieail Lathan spend Saturday mornings in St. Marcus' atrium, huddled around books and papers in the midday sunlight. Brian started as an electrical engineer and rose to management positions in Oregon and now Wisconsin. 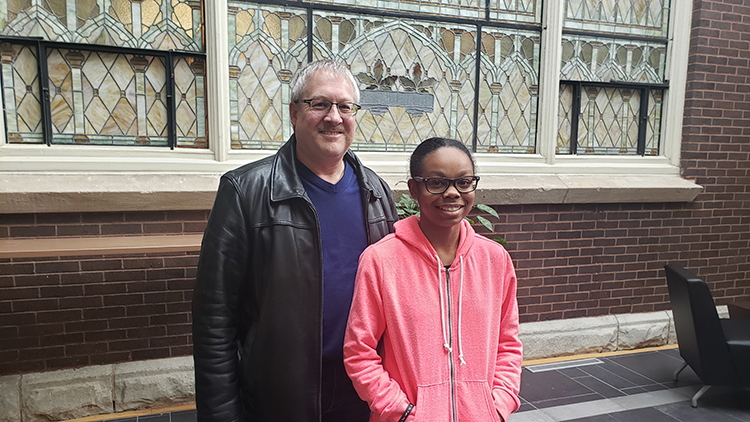 Abieail is a 9th grade alumna of St. Marcus of strong character who just couldn't clear the standards of her challenging freshman engineering course. She could feel herself floundering early and spoke up for outside help. When she took home an F on her progress report, she and her mother knew they needed change from people they trusted. Abieail lets out her frustration. "Keeping my grades up is not just an end-of-quarter rush, but a daily need! An F would send me to summer school. Even worse, it would keep me from college." St. Marcus staff soon introduced her to Brian, and the pair connected to fast-developing results. Time spent reviewing corrected homework, celebrating success, and looking to the days ahead has helped Abieail get a B on her midterm test and a C for the semester, a grade she wants to improve even further by next semester. "When I couldn't understand it, engineering was just boring to me," says Abieail. "Now, I see how everything fits together and how I might use it someday." But, for her, it goes beyond that. "I used to depend on things happening to me. I would ask, 'Mom, are we meeting him today?' or just accept if someone didn't have time for me. Now, I plan things myself. I know that if I don't advocate for myself in life, no one's going to know to help." Brian would love to see even more church members step forward, whether with academics, neighborhood service, small group Bible study, or worship support. "I had a smaller church background where there were not a lot of opportunities. It's neat that our congregation always looks to connect others to opportunities. Not enough churches do." We are excited to find ways to connect your talents to people in need. A servant heart honors Christ's example and is a mutually rewarding experience. Join us for Volunteer Weekend this Saturday and Sunday to get started with a meaningful volunteer opportunity. Ready to start the process sooner? Go to our volunteer page to read about the types of volunteer categories most readily available and to fill out a form telling us how you want to share your time!